Texas Rangers Cards: 2014 in review - Starting Rotation. If I reviewed all 40 pitchers who took the hill for the Rangers in 2014, this series would easily reach into the 2015 season. Three of the 40 were position players J.P. Arencibia, Mitch Moreland, and Chris Gimenez. I'm going to skip their short outings. Needless to say, the pitching staff was a mess and the turnover was unreal. Injuries were the main culprit but the team did move a few arms in other ways. Jason Frasor, Joakim Soria, and Justin Germano were traded. Hector Noesi and Jerome Williams moved on to other teams via waivers. Daniel McCutchen, Joe Saunders, and Phil Irwin were outright released. I'm not going to review those guys no longer with the club. By my count that takes us down to 29 pitchers who appeared in 2014 and are still with the team in some form or other. I'm going to break the pitching staff up between starters and relievers but be warned, there was a lot of crossover. The Rangers had ten pitchers who started games in the majority of their appearances in 2014. I'm going to cover those ten under the category of starters. A few other guys made spot starts but spent most of their time coming out of the bullpen. They'll be covered under relievers. Yu Darvish was the ace of the rotation for 2014 even before the 2013 season ended. He came into the 2014 season in the same role in spite of missing his Opening Day start due to neck stiffness. Darvish made 22 starts for the club and posted a 10-7 record, the only winning pitcher to make a significant number of starts. It wasn't the most starts on the team though and was a drop from the previous two seasons. That drop was attributable to two trips to the DL during the course of the season including one that ended the year. Yu's innings pitched dropped as well to 144.1. His ERA tallied to 3.06 and his WHIP to 1.261. He was selected to the All-Star game but didn't play due to injury. Derek Holland was supposed to be the number two punch behind Darvish in 2014. He fell on some stairs while playing with his dog during the off-season. The resulting knee injury required surgery and Dutch spent the majority of the year on the Disabled List and in rehab assignments. He did return late in the season and made five starts and one relief appearance (on the last day of the season). His 1.46 ERA and 1.054 WHIP over the 37 innings he pitched were a glimpse of what was lost by his injury. Matt Harrison was slated to be number two in the rotation once Holland injured his knee. Matt lost most of the 2013 season due to back surgery and hopes were high that he would return to his pre-surgery form. He made just four starts and tossed only 17.1 innings before experiencing more back pain. That's probably what caused his 4.15 ERA and 1.846 WHIP. Harry underwent a second back surgery (spinal fusion) and missed most of the season for the second year in a row. Martin Perez was looking for a breakout season in 2014. Instead he made eight starts and pitched 51.1 innings while compiling a 4.38 ERA and an 1.344 WHIP. His season ended with Tommy John surgery. He is expected to start throwing again in November. 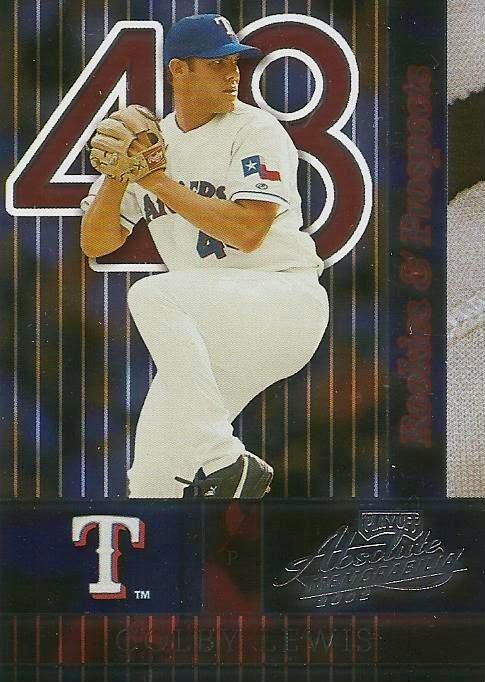 Colby Lewis, shown above on card 163 of the 2002 Absolute Memorabila set (576/1000), was a question mark headed into Spring Training. He was recovering from hip replacement and flexor tendon surgery. His chances of a full return were not good. Partially due to Holland's injury, Lewis made the team. To much amazement, Colby pitched the whole season without any time lost to the DL. He made a team high 29 starts and his 170.1 innings pitched were also a team high. Lewis' 5.18 ERA and 1.521 were high and accounted for his 10-14 record. At least he was there and pitching though. That's much more than a lot of other guys covered in this review. Nick Martinez was supposed to get a look in Spring Training and maybe a few spot starts to ease him into things. Instead he made 24 starts in 29 appearances and pitched a total of 140.1 innings. Early struggles led to his 4.55 ERA and 1.461 WHIP but he showed much improvement in the latter part of the season. Nick Tepesch got some starts in 2013 with mixed success. He was viewed as a possible fifth starter or maybe a swing man. The decimated pitching staff dictated otherwise and Tepesch made 22 starts in 23 appearances with 126 innings pitched. He was a bit up and down as shown by his 4.36 ERA and 1.365 WHIP. Like Martinez, Nick showed improvement late in the season and ended the year on an upswing. Miles Mikolas was a mid-season arrival and made ten starts for the Rangers. He threw 57.1 innings in the process. While Miles had a few bright moments, he struggled overall while getting tagged with a 6.44 ERA and an 1.430 WHIP. Lisalverto Bonilla came up in September and made two appearances out of the bullpen before making three starts to finish out the season. He created excitement in the 20.2 innings he pitched by winning his first three starts – the first time in Rangers history that's happened. On his way to that record Bonilla put together a respectable 3.05 ERA and an 1.210 WHIP. Tanner Scheppers was supposed to make the move from the bullpen to the rotation in 2014. Things looked good in Spring Training. Tanner even made the Opening Day start when Yu Darvish wasn't ready due to a sore neck. The transition didn't work out well and Scheppers ended the season on the 60-day DL after making four starts in eight appearances. He got hammered to the tune of a 9.00 ERA and an 1.783 WHIP and lasted just 23 innings before his season ended. As you can see, the starting rotation was a real mess in 2014. Nothing seemed to work out the way it was supposed to. Barring a major problem, Yu Darvish and Derek Holland will be back at the top of the rotation in 2015. If Darvish can stay on track and Dutch continues his late-season record, they will be a formidable 1-2 punch. Things could get a little sketchy after that. Martin Perez is not expected back until at least June of 2015 and Matt Harrison may never pitch again. Colby Lewis is wanting to return to the Rangers and approached General Manager Jon Daniels about a contract before the 2014 season even ended. That's a good sign but Colby is probably a steady number four at this point in his career. If Texas can re-sign him reasonably they should do so. It's likely that Nick Martinez, Nick Tepesch, and Lisalverto Bonilla will duke it out for the remaining spots in the rotation. Miles Mikolas might make a case but he's got some catching up to do to get back in the mix. Scheppers is probably headed back to the bullpen or the minors in 2015. There's always the possibility that somebody might make the move from the bullpen to starting rotation or another young gun might come out of the minors. Based on the word from the front office, a big name free agent signing is unlikely so the Texas will likely be riding with what they got. How the rotation works out for 2015 will be key to the Rangers chances for a bounce-back season.